Each pink dot represents a connected Solaris 10 user - not a downloader, but an individual or machine (independent of who made the server) that connects back to Sun's free update service for revisions and patches - applied to an individual machine, or a global datacenter. This doesn't yet account for anywhere near all Solaris 10 downloads, as most administrators still choose to manage their updates through legacy, non-connected tools. But it's directionally interesting - and shows the value of leveraging the internet to meet customers (new and old). Finally Sun Cluster 3.2 is out. You can download it here for free. Just to highlight it - SC3.2 supports ZFS so you can for example build HA-NFS with ZFS and it works like a charm - I've been running such configs for months now (with SC3.2 beta). Also I know people generally don't like to learn new CLIs but in case of new SC it's worth it - imho it's much nicer. Additionally thanks to Quorum server it's now possible to setup cluster without shared storage - could be useful sometimes. Documentation is available here. Solaris Cluster is supported on Solaris 9 9/05 and Solaris 10 11/06. Recently I've noticed in Sun Download Center that I can download files the old way using save as in a browser or I can use Sun Download Manager directly from web page as JavaWS - I tried it and I must say I really like it - you just check which files you want to download and start SDM (from web page) and files are immediately being downloaded. It offers retries, continue of retrieval not completely downloaded files, automatically unzipping zipped files, proxy servers. All of it is configurable of course. So after my short vacations and attending to LISA I'm full of energy :) Well, me and Andrzej decided to start thinking about next Unix Days. I guess I'll write something more about it later. 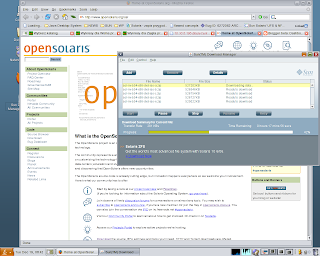 Availability Suite (AVS) software is going into OpenSolaris! systems), or many-to-1 (as is now possible with ZFS). either memory queues or disks queues. for Sun StorageTech Availability Suite in 2007![...]" Finally long awaited update 3 of Solaris 10. I've just put it on x4500 box.